This young woman has perhaps seen twenty summers or thereabouts, though she appears far younger. Long limbs and a petite, whip-thin figure provide her with an air of youth, while wide, expressive gray eyes seem to be the focusing points of her face. A direct gaze and ready smile combine into her rather infectious personality. She's quite short, but stands straight, and rarely slouches; even so she only comes up to about five feet. A widow's peak shows on her forehead, punctuated only when her hair is pulled back. Pale tresses hang down to her waist, straight and naturally a chestnut brown- time in the open, however, has lightened it to a pale color, gleaming like gold where the sun meets it. Her features mark her as a borderlander, with a sharp, sculpted quality to them that no amount of soft living could ever wipe away. Miss A'dercai is a somewhat young woman, depending on standards of measurement. Her family is old and quite well established, but, unlike many others, it does not have great political influence. The members of the family are mainly merchants, with little variation amongst them. She herself wishes to follow in her parents footsteps, shipping exotic things of all sorts, including porcelain, animal hides, tabac, ivory and silk all the way from the Shara- coming through the sea folk, of course, to most of the Westlands. 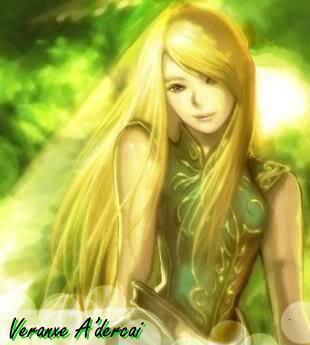 She was born in Shienar, to Lainar A'dercai and his wife, Aylema A'dercai, in a village near Fal Dara. She has two siblings, an older brother who specializes in trading weapons, and a younger brother who joined the borderguard recently. She was raised alongside her cousins in the village, learning basic sword and grappling moves. However, she has never truly taken to fighting, though she is competent at defending herself, she prefers to not have to hurt people. After all, there are only so many times you can attack people before they stop purchasing goods from you. Several months after her fourteenth birthday, her parents decided to move away, to a town she had never heard of in southern Andor. She was shocked, but had to accept the news, and they began preparing to move. The next week, the day after they had left home, she began to grow ill with a fever, seeing hallucinations and hearing disembodied voices. That night, she wandered off into the nearby forest, unable to recognize where she was or what she was doing. Her family searched for her to no avail, eventually giving her up for dead and continuing their journey. Almost a year later, she came to herself in Cairhien, helped to survive through the help of strangers she would never meet again. She sent several letters to her family, and met them again, her life beginning to get back to normal. From then on, she found herself growing more into the role of a merchant, helping the family business but at the same time wandering the countryside, often living for days in inns and only going back once in a while to visit her family. The last time she was seen (OOC: 2011), she was near Cairhien with a companion of the canine persuasion.